WARNING! Dont hit enter on the title screen! The tutorial is unfinished and broken! Please be aware that this is a proof of concept and that this game is not complete, and thus may be prone to bugs, glitches, and overall messiness. TKO is a game created around a single idea: How can you make high skill play like the kind seen in fighting games available and understandable to players of typically "low skill" games like dating sims and visual novels? My group decided to tackle this game seed through a number of different prototypes, but this version of the game, the combo-based dating sim, was what we decided to move forward with and turn into a proof of concept. 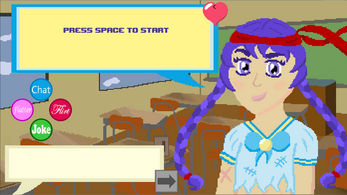 We thought the over-the-top stylings of both the fighting game and dating sim genres would blend particularly well together, and we were able to create a basic combo-based input system that allowed players to mix and match different types of interactions to best suit the tone of the conversation as well as our love interest's mood. We weren't able to create as complex an interaction system as we had hoped, but there is hope for potential future iterations of TKO where we might get to flesh things out more. Use WASD to input combos and spacebar to do, well, everything else! Download the zip folder, unzip, then run the executable inside!